Do you have materials that are left over from a remodel or DIY project? If you have a plain patio that is not being utilized, then you have the option to add a backyard kitchen. This is a great way for you to be frugal and combine a lot of second hand items. Used pallets will be a great source of wood to use to build a backyard kitchen. You can also use various pieces of wood that is left over from other projects. The most important part of this project is to make sure you have the proper measurements for all your second hand items. 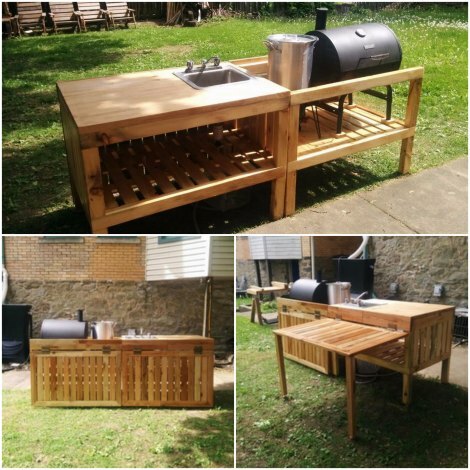 There will also be a few small details to consider when building a backyard kitchen. An optional sink will need a drain and be connected to a source of water. A decent place to keep a container of propane for a grill or other cooking vessel will also be needed.